Objects for video surveillance are most often located on the street and the distance to the server usually exceeds the critical 100m. To solve the problem of remote connection of IP cameras using copper wires (twisted pair) or coaxial cable, special VDSL2 converters are used. 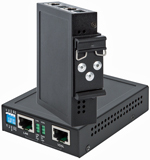 Converters have Ethernet ports for connecting IP cameras and work at a distance of up to 1.7 km. Often such devices are called Ethernet Extender. The line connection is organized using a pair of VDSL2 converters, remote and local. IP cameras are connected to the remote converter via Ethernet ports. The local converter has one port connected to the line, and the second port to the Ethernet switch. In addition to transmitting data, the qBRIDGE-307b converters also allow power to be transmitted via a link to remote video cameras.